Some four years on from their debut album, one that displayed both promise and potential, Snakecharmer returns with appropriately titled second album, Second Skin. But it also comes with a change. 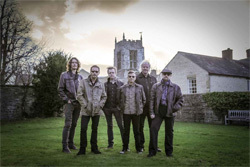 Founding member and lead guitarist Micky Moody left the band last year, being replaced by Irish guitarist Simon McBride. The renowned Guitarist magazine has called McBride "among the best blues-rock players anywhere in the world." The remaining members are Laurie Wisefield (Wishbone Ash), Harry James (Thunder, Magnum), Adam Wakeman (Ozzy Osbourne), and Chris Ousey (Heartland). There's a signature musical theme in Snakecharmer sound that you instantly hear and recognize in Second Skin. That theme is the obvious blues infusion that swells in most every song. It comes largely from Ousey's vocal style, which is soulful and smooth and, of course, from McBride's guitar lines. Actually it's in several of the quieter ballads where this pairing of voice and guitar bring out the significant blues motif. Notable are I'll Take You As You Are, Fade Away, and Forgive & Forget But it's also found in Where Do We Go From Here, with it's smoldering smooth start that leads to a rising crescendo. Also adding to the bluesy hard rock feeling is well-placed old school swirling Hammond organ found in many songs. It gives the Snakecharmer an earthy warm sound, something akin to Seventies blues hard rock. A few more songs, besides the ones above, should be mentioned in closing. One is Hell Of A Way To Live which moves by the substantial groove that starts with the drums and continues with the bass joining in. Another notable song is That Kind Of Love which has a sweet AOR groove and a darn catchy hook in the chorus. The same could be said for Sounds Like A Plan, but what sells this song, besides groove, guitar, and chorus, is what surely sounds like a brass section in the arrangement. Either that or it's Wakeman simulating the sound. It sounds very cool. 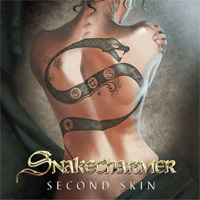 Suffice to say, Snakecharmer's Second Skin is fine second effort for the band, some very entertaining blues-infused melodic hard rock. Easily recommended.